Yes, good point. I will update the post to include that. However, we would ideally like to discontinue our Widget installation. The Template install is much more stable, and future backend updates will most likely only apply for Template installations. We realize that it's a pain, but it will be worth it in the long run. the issue is also not solved after changing to template installation. The earlier comments are also missing!!! It is causing huge issue for me now!! I replied to your email. We'll get everything sorted out. Will I lose all the comments that I have using the old way (widget mode) ? No, as long as you follow the instructions above, all of your previous comments from your Widget install will still show up. Feel free to contact us with any specific questions related to our site through our contact form so we can better assist. I switched over to the template installation and everything looks perfect except for one thing. When looking at my homepage there is no longer a comments link (comments #) at the bottom of posts. I went through my ID settings and everything. Any help would be appreciated! 🙂 Thanks! I replied to your email. Please send in your template using the instructions I sent and we'll take a look. I have the same problem on mine. I took a look at your site here and your all set – you have installed ID using our Template install. Let me if you have any questions. For anyone else, the easiest way to determine if you have the Widget or Template install is to go to your Layout tab in your Blogger dashboard, and check if you have the Widget installed in your Gadgets. You can use the instructions that I published in the blog post above. If you're feeling particularly adventurous you can go to your site and search for our code in your page source. Depending on what the code is, you will be able to determine if you are using the Template or Widget install. 1. Go to a blog post on your site. We'll use @topjer's site as an example. 2. View the page source for the post. You can do that by right clicking on the post and selecting the option to "View Page Source." 3. When you view the page source, use the search feature in your web browser (usually ctrl + F), and search for "IntenseDebate". Notice "widget-content." That indicates that it is our Widget installation and not the Template. In that snippet you'll notice "bloggerTemplateLinkWrapper." That indicates that it is a template installation. Again, this is just a pro-tip and not something you will need to do. The easiest way to figure it out is to go to your Layout page and look for the Widget. love this explination and it was easy to see that I am all set. I have installed new template yet not able to see my comments. Comments are seen in my mail but not in blogposts. I sent you mine as well. I've always used the template install, but it quit working about 2 days ago. Thanks. You should receive a reply soon. We've been a bit backlogged due to this transition and are working our way through all of the support requests. Thanks for your patience – we'll get everything sorted out. I originally used the template method to install Intense Debate, but had the same problem as Random Deals above. Ramdom Deals said: "I switched over to the template installation and everything looks perfect except for one thing. When looking at my homepage there is no longer a comments link (comments #) at the bottom of posts. I went through my ID settings and everything. Any help would be appreciated! Thanks!" I wrote a message asking for help on this but have not had any response. I have followed all directions above, but a problem remains with some of my recent posts (before reinstalling). Comments are being saved separately so some appear and others not. Here is my site: http://www.thepinesofrome.blogspot.com Could you please help me out with this? Thanks! Sorry for the delay. We're working our way through all existing support requests and you should receive a response soon. We've been a little backlogged with emails due to this transition. Currently we don't offer a way to map comments to a new domain, so that's likely causing the issue. Please email details at support [at] intensedebate [dot] com. Also, please send specific links to the comments in question. We have some great instructions on how to access the comment link and send it to me. Thanks. I am having a problem that on occasion my intense debate comments disappear and bloggers comments show up instead. So for instance, today I had two people comment using the intense debate comments for a blog post written today, then an hour later I saw that those comments were gone and someone had commented on the post with the blogger comments. I tried reinstalling Intense Debate with no luck, the blogger comments still appear. I've had this problem before and it comes and goes. Sometimes even the Intense Debate comments come back and replace the Blogger Comments. Blogger introduced a new mobile theme which unfortunately doesn't support IntenseDebate. 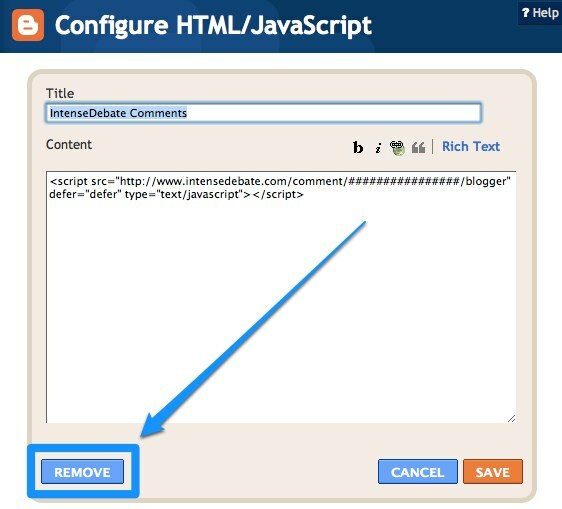 If you activate the mobile theme that will reactivate Blogger comments. If someone posts a comment using the mobile theme, they will post through Blogger comments which will then override IntenseDebate so it won't load on posts in your normal theme.To prevent this from occurring, please disable your mobile theme in your Blogger admin panel. Sorry for the inconvenience. My apologies for the major delay – your comment slipped through. Should I try to reinstall it again? If you follow the instructions on this blog post you should be all set! 🙂 If not, please contact us at here and we'll take a look. Please send me your template as an attached XML file to support [at] intensedebate [dot] com and I'll take a look. Please reference copy/paste your comment in the email so we know what to look for.